Nowadays, waste generation and waste management are among the top environmental issues. Without proper waste handling, waste decomposes and gas is released. About 50-70% of this gas is methane and carbon dioxide, which cause the greenhouse effect. In addition, inorganic substances contained in waste reach the soil with fertilisers and have negative impact both on the soil fertility and human health. Scientists from the Research Institute of Environmental Protection at Vilnius Gediminas Technical University (VGTU) – prof. habil. dr. Pranas Baltrėnas and prof. dr. Edita Baltrėnaitė – have an idea how to reduce the growing amount of waste, fight the greenhouse effect and negative impact on environment by using small bioreactors. 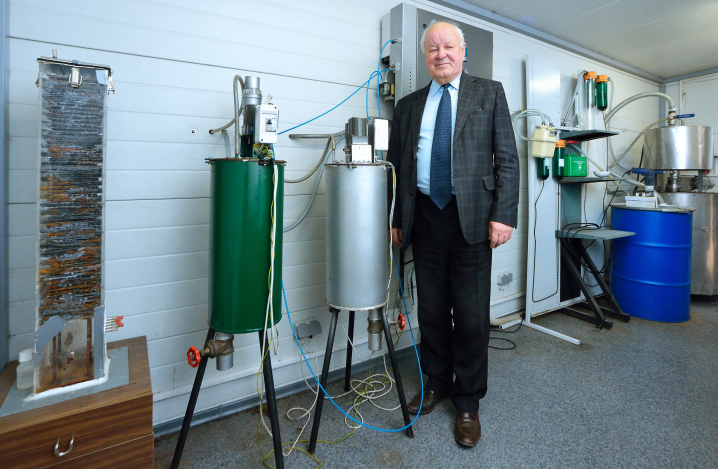 According to P. Baltrėnas, small bioreactors can produce good, valuable and clean fuel – biogas – from sludge, food, municipal, agricultural and other decaying, biodegradable waste naturally in just a few weeks. “Biogas can be used as an alternative to fossil fuels, or to produce heat and energy. The use of biogas could reduce the amount of greenhouse gases, pollution of terrestrial waters and groundwater, and, at the same time, solve the problem of growing amounts of waste. It is of particular relevance for food industry, forestry and agriculture,” emphasised VGTU professor. Scientists and students have been working on this idea for 5-6 years. Recently, the research on small bioreactors has been published as a monograph by one of the most well-known global publishing companies of academic journals and books, focusing on the fields of technology and medicine – Springer. 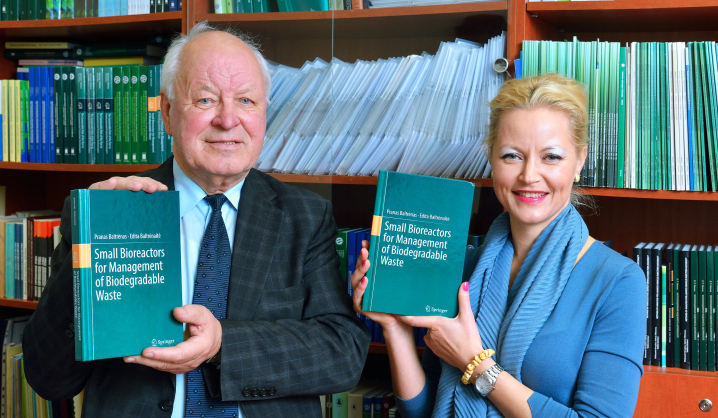 The authors of the book identify the methods for producing the most energy from biodegradable waste by developing small bioreactors (patented by the scientists), which biodegradable wastes are optimal for small bioreactors, and how these choices can be used to increase bioreactor productivity. The fact that the publishing house accepted the book and decided to publish the research is an exceptional and very important event. There are over 200 Nobel prize winners among authors of books and articles published by Springer. There is a strong emphasis in the monograph that small bioreactors not only contribute to environmental protection in general, but also solve a very common problem which small farms face in Lithuania. “Farmers, who have several cows, pigs, chicken, and who grow fruit and vegetables have problems with handling unnecessary grass, decomposing food waste, and animal faeces. This is exactly what small bioreactors are for. For example, a bioreactor filled with one cubic meter of biodegradable waste can produce the amount of gas which is enough for cooking for one household,” described VGTU Professor. It’s a double benefit: cleaner environment with properly handled waste and clean fuel – biogas. Under projects of “EUREKA” and “Intelektas LT” VGTU scientists have already made several small bioreactors: one 200-litre capacity, two 30-litre and six fife-litre. These bioreactors are used for research. Now, the scientists are working on an improved three stage bioreactor, which will solve the current problem. “When bioreactors are in continuous operation, oxygen can access the anaerobic process – microorganisms digesting the waste without oxygen – during the refill of chamber and kill the microorganisms. Bioreactors with three stages will ensure that oxygen is removed at maximum in the middle chamber and the waste will reach the main chamber without oxygen,” said P. Baltrėnas. This new bioreactor is pending the European patent and the research on small bioreactors continues. A group of researchers work on a project funded by the Research Council of Lithuania, a PhD thesis on the topic is in progress.